B0978. Henry T. Finck. 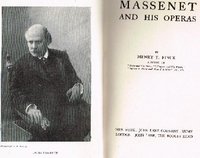 Massenet and His Operas. New York, John Lane, 1910, First Edition. 245pp. Index; Photos incl. Gerville-Réache, Renaud, Dalmorès, Garden, Gilibert, Farrar, Lina Cavalieri, etc. 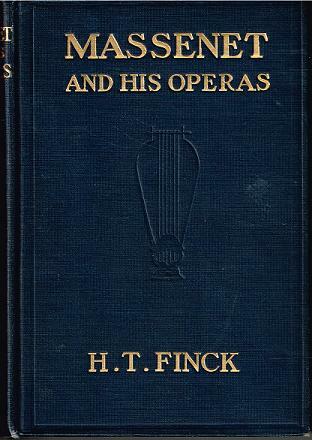 “Henry Theophilus Finck was an American music critic, a leading promoter in the United States of Richard Wagner and his musical theories. Finck was born at Bethel, Missouri, and raised in Portland, Oregon, where he was taught piano and violincello. He taught himself Latin and Greek so thoroughly that he was able to enter Harvard as a sophomore in 1872. At Harvard, he studied philosophy, the classics, and music. He graduated in 1876. He attended the Bayreuth Festival in 1876, of which he wrote accounts for newspapers and magazines. The Harris fellowship from Harvard being awarded to him, he spent three years (1878–1881) in the study of physiological psychology in Berlin, Heidelberg, and Vienna.